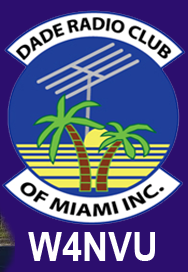 April 2010 Meeting Minutes – W4NVU – Dade Radio Club of Miami Inc.
Ernesto was not here tonight as he is at work. Jason Bunch presided over the meeting and welcomed everyone. The meeting was not broadcast live on the air tonight from the EOC as Ray is not present. Testing was being conducted in another room. The microphone was passed around the room and everyone took turns and stated their name and call sign. Jason welcomed everyone again. We have a quorum. The minutes were not posted on the website. Carl spoke about the 444.200. It is working. Robert spoke about the 220.000. It’s dead. Still looking for a home. The 146.760 – It’s OK.
Jason asked if there was any other old business and there was none. Carl spoke about the MS150 coming us April 17 and 18. Applications are online. See Matt if interested in volunteering. Information will be on South Florida Hams. John Hall spoke about the Florida Bike Triathlon last weekend for Chronic Fatigue Syndrome. Arturo spoke about Field Day – He said that Philipe was speaking with Cape Florida to see if we could use the Lighthouse. They need to get back to him. It is the last weekend in June – June 26 and 27. We will discuss it at the next meeting. Dave came in and announced and Janice Horn passed the Tech exam and so did 2 others. American Radio Club expired. They still meet at the Latin Café on Coral Way and 74th Avenue and every Friday night. Sunday morning Flipper sets up and they have breakfast on Flagler and 107 Avenue. John McHugh spoke about the University of Miami and the repeaters. There are 3 of them there. One we own, one is Ray’s and one belongs to George. It does not make sense to have all 3 at one location in case of an emergency. It was discussed that we should move one – the 146.76 to the Stephen P. Clark building downtown Miami. The 147.345 is illegal there. It was originally on Card Sound Road and was Frank’s repeater. Other 76’s stations – are in Orange County, Pasco County, Duval County and Escambia County. The EOC has no VHF repeater. John Hall said that putting the 146.76 downtown would be 300’-400’ higher and we might have problems with the West Coast in the Tampa area. If we put it downtown there is no filtering and we would need to get circulators to cut out the interference, etc. This needs more thought. Robert advised that the ham repeater at Channel 6 has problems but changing anything will cause a storm. Dade Radio Club will not be involved in the removal of the 345. John McHugh advised that it is causing interference and is illegal. Robert wants Ray to get to the 220 site. Robert said that if we leave UM that we won’t be able to get back in. It was suggested that all repeater people get together to work out the problems. Randy made a motion that all the repeater trustees have a meeting to work out the repeater problems (Ray, Robert, Carl, Meritt and John) (amended by Esther to add John Vecchio and Ernesto to the meeting) and that an email be sent to all of them, seconded by Caesar. Passed. Robert spoke about a bracelet that clips on and contains a UPS thumb drive that works with Mac or any PC. They are selling them at the Museum. They put all vitals on the drive and if something happens to you, it can be accessed by fire rescue. It costs $25.00 each. You can also go to Sportmemorybracelet.com and look for electronic ID and they have all the information there. Dave came in again and announced that Emilio Cires passed his Tech exam. There will be a free flea in January at the Museum of Science. Jason asked if there was any other business. With no other business, Jason thanked everyone for coming. A Motion to close the meeting was made by Caesar, seconded by Arturo. Voted and passed. The DRC meeting was adjourned at 20:30.